With women making up fewer than 5% of airline CEOs, more needs to be done to encourage women into senior roles within the aviation industry. Find out why Hunt & Palmer’s Julie Black, aircraft broker and the only female member of the BACA council, is an important role model for the industry. The theme for International Women’s Day 2017 was #BeBoldForChange, encouraging us all to take positive action to help forge a better working world – a more gender inclusive world. And one woman who is taking positive action every working day is Julie Black, the newly appointed Manager, Executive Aviation at Hunt & Palmer, member of the council of the Baltic Air Charter Association (BACA) – and a much-needed female role model in the male-dominated aviation industry. If you’re looking for female role models in aviation, Julie Black is arguably a perfect candidate. For Julie and those women presently occupying management positions within the aviation business, this stereotypical view is hugely frustrating and one that really needs to change. Not that there is anything wrong with being cabin crew of course. The job is very demanding and at the center of passenger safety in the air yet amongst people generally, the view is one very much that of the 1960’s air stewardess when in fact that is not a realistic appraisal of their role today. It’s this kind of assumption that has made Julie more determined to be a visible, positive role model to tackle unconscious prejudices and encourage more women into the industry. So why is it then, that for many women setting out their careers, aviation management is not their first thought? Every year thousands of women (and men) apply for the relatively small but sought after cabin crew positions and there is certainly scope for the dedicated to move up the ladder into more senior roles if they wish. Yet beyond the aircraft cabin, few women consider that there is a high flying career waiting for them in this dynamic and challenging travel business. No surprise then that figures show a poor representation of women across the sector. Julie herself fell into a career in aviation purely by accident; while trying to earn a few quid to make a dent in her student debt, she was offered a temporary assignment in the marketing department of London City Airport and from the first smell of the jet fuel, she was hooked. It would also be fair to say that, the aviation industry like many others, has a poor reputation when it comes to gender equality. According to Women in Aviation International, in the US just 6.6% of women are pilots and only 2.2% are female mechanics. In Canada, statistics indicate that only 5.2% of licensed commercial pilots are women. Things aren’t much better in the UK either. Civil Aviation Authority (CAA) figures show that only 3.3% of all licensed air transport pilots in the UK are female while according to the Royal Academy of Engineering, just 6% of the UK’s engineering professionals are women. Rising up the ranks, the picture doesn’t improve. Women in senior, visible positions in aviation businesses are still rare, accounting for fewer than 5% of airline CEOs around the world. So how do we encourage more women into aviation? 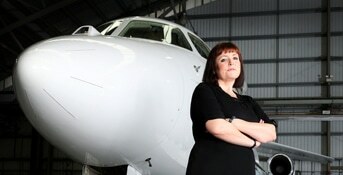 Julie’s own story of climbing the ladder in aviation is certainly inspiring. Over the past 20 years (many of which she has been as a working mother), Julie has worked her way up the ranks of several major aviation companies. Having started her career at London City Airport, Julie went onto work at London Biggin Hill and Northolt Airports before settling into an aircraft broking career. Today Julie is Manager, Executive Aviation at Hunt & Palmer, having joined this respected international broking organisation just a few weeks ago. For Julie, this is the start of another exciting chapter in her continuing story and along the way she has enjoyed a challenging and star-studded career. For many years she was the go-to broker for an impressive portfolio of the world’s biggest names in music, from headline rock bands to solo artists and rising stars, not to mention some of the world’s richest business men and women. Julie sees her new role of heading up the executive aviation team at Hunt & Palmer as a real career accolade, one which sits neatly alongside some of her other achievements in the aviation, such as being the only female member currently sitting on the council of the Baltic Air Charter Association (BACA), the charter broking industry’s accredited body. Julie is a passionate advocate for women in aviation and is available for interview or comment on her career, and what the aviation sector can to #BeBoldForChange in 2017 and encourage more women into the industry.